MBHS students launch their weather balloon Wednesday morning at Prescott Field. FARMINGTON - Students from the Mt. 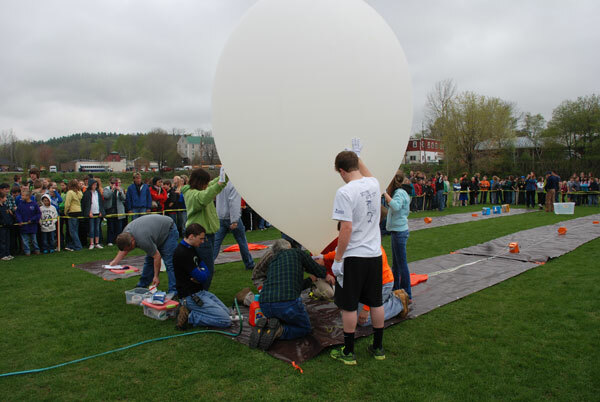 Blue Regional School District, as well as schools outside of Franklin County, counted down the final five seconds today at Prescott Field, just before releasing an enormous weather balloon into the overcast sky. Hauling scientific instruments, a camera and students' precious experiments on lengths of cord, the balloon rose quickly above Prescott Field and was soon lost from view. It was expected to rise as high as 100,000 feet, into the upper stratosphere, and take roughly three hours to return to earth. 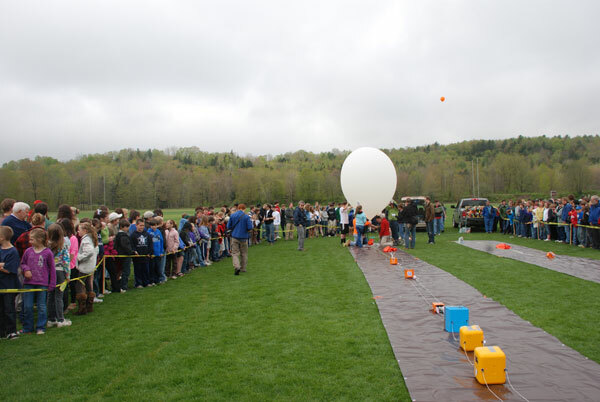 As chattering elementary students drifted back toward the tarps, where the Westbrook and Winthrop classes were preparing their own balloon payloads, Mt. Blue High School biology teacher Doug Hodum's chase team was discussing a potentially ominous development. The balloon's GPS device was not responding. The best estimates, given wind speed and atmospheric conditions, put the balloon coming down somewhere in the Orono area. One student noted that the estimate had the balloon, as well as a school year's worth of student projects, coming down in the Penobscot. "We're just hoping it doesn't land in a river," student Megan Brown said. Students from across the district attended the launch. They were joined by the Winthrop and Westbrook classes, who were launching their own balloons. 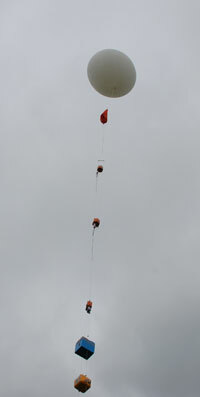 Students, assisted by graduate students from the UM system, attach the payload to the balloon. The balloon will take roughly an hour and a half to rise to its maximum altitude. The launch is part of a revolutionary new program designed to provide high school students with access to equipment previously left in the hands of government agencies and advanced college programs. 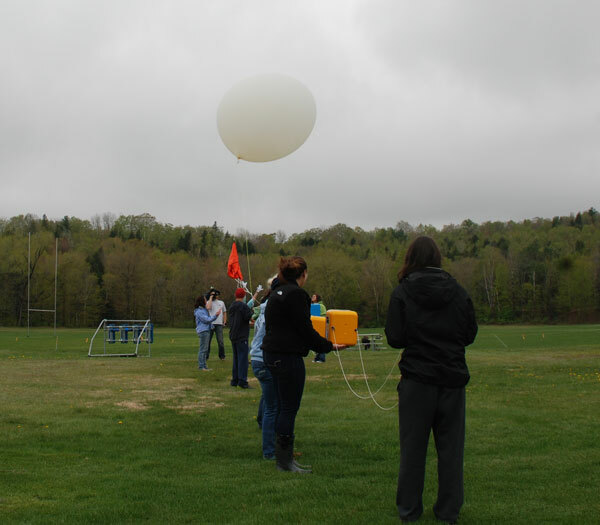 Three schools participated in the Astro-Scientific Ballooning Pilot Project, financed by the Maine Space Grant Consortium through a $400,000 NASA Cooperative Agreement award. Hodum spent part of his summer vacation last year in Texas, taking part in a high-atmosphere balloon launch. 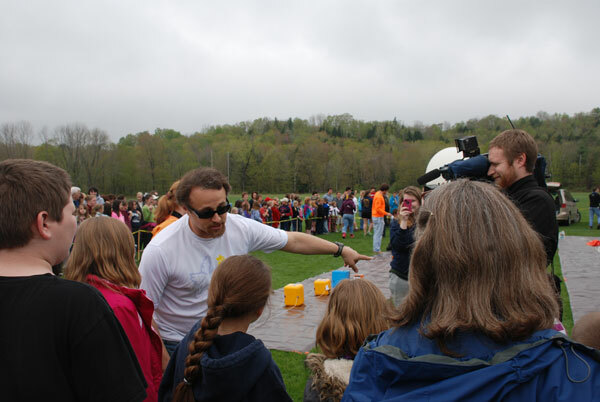 Experts from NASA and graduate students from the University of Southern Maine's microbiology program assisted the Mt. Blue students in launching a test balloon in October 2011. That balloon, significantly smaller than the one used in Wednesday's launch, was kept on a tether. Since October, Hodum said, his students have been designing a series of experiments to be included in the balloon's payload. One will study the effect of ultraviolet light on sea monkeys, another will do the same on apple mold. Another experiment will test a chemical that purports to protect bacteria from UV. All of the experiments, which were designed by students and vetted by NASA, will be matched against control groups. In addition to representatives from NASA and USM, the launch was assisted by University of Maine students and a representative from Stanford. Students from Winthrop and Westbrook were joined by elementary students from across the district at Hodum's invitation. The teacher, when taking a break from answering questions about the balloon and experiments from the crowd, said he was pleased to see so many students attend the launch. "I was really happy that so many kids were able to turn out," Hodum said. GPS or no GPS, Hodum, his chase team and some graduate students will be traveling across the state to find their balloon Wednesday afternoon. Hopefully not in a river. MBHS biology teacher Doug Hodum answers questions posed by elementary students at the launch. Nice hands on teaching! Where will it land? What will the students learn from their experiments? I hope the Bulldog will follow-up on this story. I landed in a marshy area in the middle of the woods in Greenbush... we went and retrieved it after the launch and our balloon was a success :) It was cool because we made our own experiments and they got approved by NASA and then we got to put the whole thing together... a lot of work but it was worth it. This was a really cool experience to be a part of, glad to see our work pay off! Was the chaser group able to recover everything? Did the GPS ever start working? How high did the balloon go? Any plans for what is next? It's things like this that make me proud to be from this area. Fantastic job, Doug Hodum, and to all the young scientists-in-training. Good job, Christine. I hope I get a chance to talk to you about the whole adventure. Hoping for a follow-up story about results, what the children learned and their response to the entire project. What an exciting, hands on experience for these kids and feather in the cap of Mt Blue. The networking and exposure to other participants in invaluable. Nice job Doug! I was one of the students helping from UMaine during the launch and recovery. All three balloons were recovered by late Wednesday. The first was found early within a mile from the road near Greenbush. I helped recover the second balloon, about a mile into the woods to the south of Lowell. The third was recovered near the second, although in the middle of a swamp. Despite some technical difficulties, it was a very successful day considering all three balloons were launched and successfully recovered in one day.